Reality check – when you’re running your own business, things don’t always go smoothly. Things don’t always go as planned or anticipated. And you’re left questioning yourself again, about why the hell are you doing this? Then I’m building my business in the evenings and on the weekends. As well as, all the other stuff involved in running a business. And that’s assuming I work at full tilt, with no breaks or unproductive time! Which we know, is not always a realistic expectation being married with kids! And why it’s my passion, to help other business owners work on theirs. Is when something inevitably goes wrong. Don’t always work the way they’re supposed to. 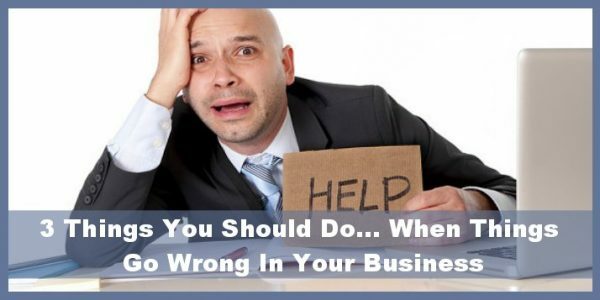 What kinds of things go wrong in your business that have you pulling your hair out? It wouldn’t come back up at all. That still led me to some frustration, as I don’t like to disappoint my tribe by being late. Control is merely an illusion, practiced by those who think they’re in control of their own destiny! You can’t do everything perfectly! Crap is going to happen, and you have to learn to roll with the punches (so to speak, lol)! And temporarily interrupted my plans for an awesome FB live. And I imagine, that you experience this frustration from time to time in your business too? Step #1: What can you do about it? Stems from a lack of control around any given situation. And I suspect your’s does too. So the first thing to look at is what you can do? Rather than what you can’t do. In my case, that was to keep resetting the wireless router, until the internet came back up. So that I could still put on a great broadcast, without beating myself up too badly about it. All the while making excuses for what had happened to my audience. Rather than worrying about what you can’t do about it. Step #2: What can you do to keep it from happening again? It’s the same thing going wrong repeatedly, over and over again. Insanity, is doing the same thing over & over again… expecting a different result every time! But ask yourself, what you can do to reduce the risk of it happening again? What can you do in the future, to mitigate your losses or stop the bleeding on the situation? You may need to put in a new process, or get some specialist support. I don’t know, you’ll have to adapt to whatever the situation is at the time. I’d already experienced issues with my internet before, so I had a service call already set-up with my provider. I just had to stay calm & realize, that you have to always be adapting and changing to your business environment… no matter what! So, that I wouldn’t be left in a lurch like that again! Step #3: What can you learn from it? There is always more to learn when things go wrong than when things go right! And consider what the situation has taught you. So, I knew who to call and get that situation taken care of… pronto! I can’t control everything, all of the time. I need to adapt and roll with the punches! Have you come up with a business idea or concept yet? Then there’s nothing in greater demand, than digital products in the education space. Forbes magazine predicts that the E-learning space will top over $200 Billion a year, by the year 2023! Because whatever effort you put into it, will be multiplied 10, 50, or a 100 fold. Everything is going digital in this day & age, from e-commerce to digital products. There hasn’t been a better time to get started than right now! You owe it to yourself to watch this 6:44 video, and did I mention the video is absolutely FREE? All from the comfort of home, in just the last 18 months. These strategies can create such an explosive global business, you’ll wonder why it took you so long to get started. Then make sure you check out the video HERE!